Last Saturday we celebrated National Train Day. We had a face-painting booth. We had a huge train cut-out for photos. We had train whistles to give away. We had a train coloring contest. 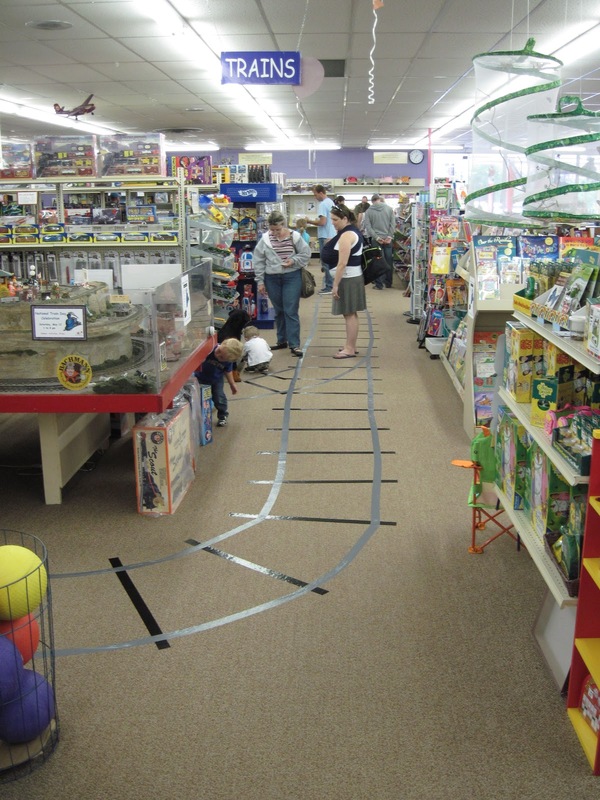 We had three train play tables out around the store. We had an electric train display. We had a model railroading expert talking about train history. We had a prize drawing for trains. We had train stickers for the kids. We even had railroad tracks made out of duct tape lining the floor and leading the kids to every station. Not a single idea there was mine. Oh, I am not saying I couldn't have come up with those ideas (although I might not have had as many). But I purposefully chose to let my staff run this event. All I did was make signs as requested, send out an email and press releases, and post to Facebook. The staff did all the rest. They found the cookie baker, the story teller, and the face painter. They picked the coloring pages, the demos and the prizes. They made the decorations, manned the stations and made the announcements. All I had to do was walk around and snap photos, talk to customers and have fun. The smiles on the customers' faces was constant and beaming. The smiles on my staff's faces was brighter than ever. But the smile on my face was biggest of all. All of the team building, all of the staff trainings, all of the coaching was paying off. They took ownership of the event and made it one of the best events of the year. Today the staff is still buzzing about it. More importantly, they have a higher sense of pride in the store and the experience of our customers. They took ownership of the event and that has translated into ownership of the job they do here. Would you like your staff to take ownership? For a limited time, for only $1200 I can show you how to get them to buy-in and work in your store so that you can work on your store. 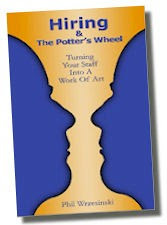 (Plus you'll get 60 signed copies of my book Hiring and the Potter's Wheel: Turning Your Staff Into a Work of Art). PS The first step for a great staff is to hire the right people. But you already knew that. What you might not know is how to recognize those right people when you find them. That's why I wrote my book. I found a way to find the right people consistently.